RPC-317 in an inactive state. Containment Protocols: RPC-317 is to be stored in one of Site-16's standard containment lockers when not being used in testing. During testing, RPC-317 is not to be used on any individuals with depressive disorders, or those with any mental conditions impairing basic mental functions1, without approval first from a Site-Director. If RPC-317 is to go out during testing, batteries can be found in RPC-317's storage locker. Any corpse that has been transformed into an RPC-317-2 instance is to be shot on sight and incinerated. 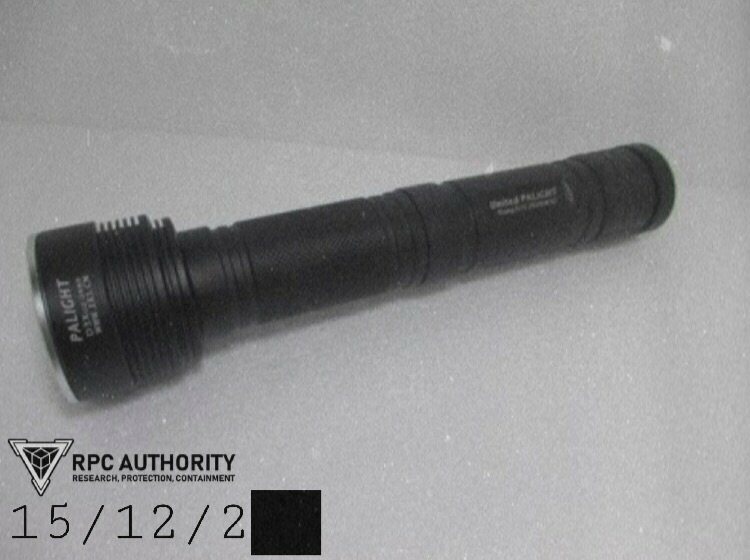 Description: RPC-317 is a large black flashlight, with no company brands or logos on it. When turned on RPC-317 will emit somewhat of an "Anti-Light" (Henceforth noted as RPC-317-1), emitting darkness from the bulb instead of light. RPC-317's real anomalous property is when it is shone on a living being. When RPC-317-1 is shone on someone, they will feel an immense sense of dread and anxiety, describing a feeling of "being watched". After approximately 1 minute under RPC-317-1, the subject will begin to experience depressive episodes. People at this amount of time exposed, however, will not be in this state permanently. After around 2-3 minutes, subjects exposed to RPC-317-1 will become notably panicked and will commonly note the feeling of being "touched" or as if something is breathing on them. At this state previous depressive episodes have a high likelihood of becoming permanent. Further exposure to RPC-317-1 is not advised, as, after around 4 minutes, subjects exposed to RPC-317-1 will experience violent seizures and brain hemorrhaging2; subjects will also experience bleeding of the eyes, ears, and finger/toenails3. This cannot be stopped, even after removing the light, and after around 50-55 seconds of the aforementioned happening, the subject will expire. 1 hour after death, subjects will begin to reanimate. These "subjects" will further be known as RPC-317-2. Once reanimated, RPC-317-2 will usually stay either, completely still, or wander about in a small area, until they come into visual contact with another living creature. At this point they will violently attack the creature until either itself or its victim is dead. After killing said victim, RPC-317-2 will begin to spew a viscous black liquid into the mouth or any open cavity of the victim, and then continue to resume their position or wandering. It is not currently known why RPC-317-2 instances do this, as it has seen to have no effect on victims of RPC-317-2. All scans of RPC-317-2's liquid show signs of blood, bone marrow, and [REDACTED] mixed together. Purpose of Test: To log effects of extreme exposure to RPC-317. Procedures: CSD-7473 was introduced into the cell, and RPC-317 was shone on him from a secure location. CSD-7473 would be looking around anxiously, and would tug at his shirt periodically. Dr. Campbell: CSD-7473, what seems to be the problem? CSD-7473 glances at the viewing chamber, and back to his surroundings, pulling a microphone on his lapel closer to him. CSD-7473 would quickly swivel around, seeing nothing behind him. CSD-7473: I don't know Doc, it's just that something's not right. Dr. Campbell: I can assure you nothing is in the room with you. We double checked it before we even let you into the room. CSD-7473: Doc, clearly you… didn't check hard enough because something is… in here. Dr. Campbell: And I can assure you something is not. CSD-7473: Whatever you say… Doc. Around 1 minute would pass. Dr. Campbell: What is it CSD-7473? CSD-7473 would be breathing heavily, seemingly scared or confused. Dr. Campbell: CSD-7473, please describe your sensations, not "feeling too hot" isn't going to help us help you. CSD-7473: I'm trying Doc I really am… I just… can't find the words. CSD-7473 would begin to back himself into a corner, holding his head and shaking it. This was noted as "normal" as depressive episodes had already been listed as of this test. CSD-7473 would emit a loud yelp as if being attacked. Dr. Campbell could be heard writing down on his clipboard. Dr. Campbell: Something touched you? CSD-7473: I don't know Doc, but that's what I felt. CSD-7473 would continue to look around, waiting for something to touch him again as another minute passed. Dr. Campbell: CSD-7473 are you alright? CSD-7473 begins to make choking noises, falling to the floor. Dr. Campbell: CSD-7473! Dammit, security! CSD-7473 would emit horrendous choking noises as he'd begin to foam at the mouth, and his eyes and fingers began to bleed tremendously. Dr. Campbell: SECURITY, SHUT OFF THE LIGHT! RPC-317 could be heard being turned off. CSD-7473 would begin to spasm and begin to cough up blood as well. Dr. Campbell: God dammit… get the disposal team in. Additional Notes: After testing, CSD-7473 was pronounced dead and placed in an incinerator, approximately 45 minutes after death. Note on CSD-5132: CSD-5132 has been diagnosed with clinical depression, and has shown signs of it in CSD-Block and during testing. Purpose of Test: To log the effects of an already clinically depressed person being exposed to RPC-317's light. Procedure: CSD-5132 was introduced into the chamber with RPC-317's light turned on. Results: Approximately 1 minute after initial exposure CSD-5132 began to violently spasm, foaming at the mouth and began bleeding from the eyes, fingernails, and mouth. CSD-5132 was sent to a med-bay to further examine the cause of death, and approximately 1 hour after their death, CSD-5132 reanimated, quickly jumping onto Dr. ████ and beginning to tear into him. Officer ███ quickly shot the reanimated CSD, leaving Dr. ████ with heavy lacerations and a broken rib. Additional Notes: Perhaps we should test this result again in a more… controlled environment. -Dr. Campbell. Purpose of Test: To further log RPC-317-2 instances goals. Procedure: CSD-6579 was introduced into the chamber with the light on, and left in for 1 Hour, 10 minutes, enough time for them to turn into an RPC-317-2 instance. Results: After CSD-6579 was introduced into the chamber, and subsequently died and reanimated, CSD-9024 was introduced into the chamber and was then killed. After killing CSD-9024, the RPC-317-2 instance began to open its mouth and proceed to regurgitate a viscous and notably "lumpy" liquid from its mouth into the chest of the CSD which it had ripped open. 2 hours passed by before a security team was sent in to kill the RPC-317-2 instance and to dispose of CSD-9024's corpse. 2. Scans of subjects after death show major internal bleeding in the brain, and severe lacerations.